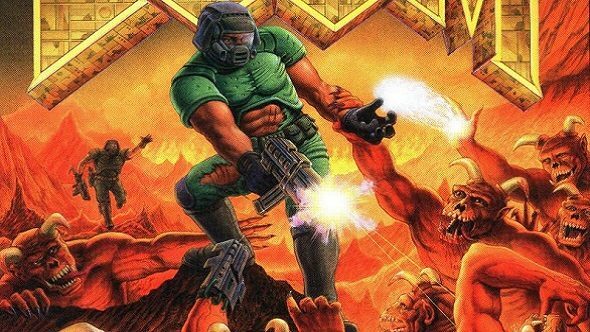 John Romero, one of the masterminds behind the original Doom, is an industry legend already, but he just revealed a bit of Doom trivia that’s cemented this position further: the Doomguy from the original box art is him with his top off. Check our list of the best old games if you love the classics. You see, they originally had a male model to do the pose the artwork was based on, but the poses the model was doing just weren’t lining up with what Romero had in mind. Frustrated, he took his top off, grabbed the gun and stood with it pointing downwards, just like the iconic pose above. “I told him to give me the gun and get on the floor – grab my arm as one of the demons,” Romero explains in his blog post. “Defeated, he deferred. I aimed the gun in a slightly different direction and told Don, ‘This is what I’m talking about!’ Don took several pictures. There are some other little titbits in the post, too. Like how the team would listen to screams from the dentist surgery next door, for inspiration for their SFX. They even scanned hospital slides to create the bloody, in-game walls.